If you’re trying to cut back, or avoid grains, you can still enjoy eating linguine with your favorite sauce. This is good news for anyone who can’t tolerate gluten, and for those who want to reduce carbohydrates. This is a no-cook recipe, with prep time a matter of seconds. The meal is healthy, fast, and aesthetically pleasing. You can go all raw by making tomato sauce in your food processor, and top the meal with sliced raw mushrooms. Sauteed mushrooms in garlic (garlic granules will suffice if you’re out of fresh garlic, or you’re in a hurry). Food Processor if you’re making your own tomato sauce. 1) Put one firm zucchini through the spiralizer. Takes about 2-3 seconds to produce noodles. 2) Put tomatoes through food processor. If you’re using prepared sauce, skip this step. 3) Sautee mushrooms in fresh garlic. You can substitute garlic granules to save time. 4) Place noodles in dish, add sauce, garlic, and mushrooms. NOTE: To add color, chop raw red reppers into the noodles. To make it a main dish, add slivers of your favorite protein. Posted on July 24, 2012, in Food, Recipes, Recommended Products and tagged kitchen gadgets, no grain pasta, quick pasta, raw food, recipes, vegetable linguine, Weight loss. Bookmark the permalink. 4 Comments. The model in the post is made in Italy. It requires no electricity, and minimal storage space. Spiralizing veggies is a good way to make everyday food more interesting. Thank you for noting my explanation was simple and clear. 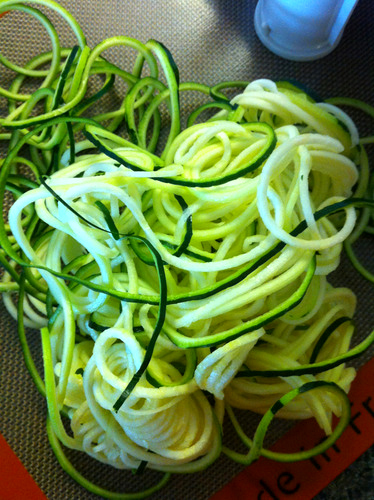 Spiralized Zucchini is an excellent substitute for anyone who wants to avoid grains, or cut down on carbohydrates. Thanks for this simple and clear explanation. Kept hearing about “spiralizers” but honestly had no idea what people were talking about. 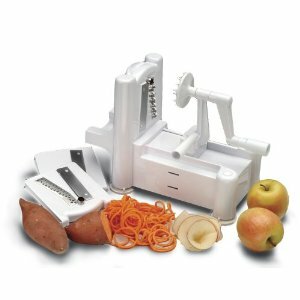 I have never heard of a vegetable spiralizer. What a great idea.